OK, these may not look “sweet”, but trust me — they are. These pillowcases were made for my little sister in law and her husband. She’s from North Carolina, he’s from Michigan. For their engagement photos and Save the Date cards, they each wore their “home team” jerseys, she in her Panthers, he in his Lions. (They’re a fun couple, aren’t they?) I hope the pillowcases will remind them that they started off in different places, but those pillows belong beside each other. 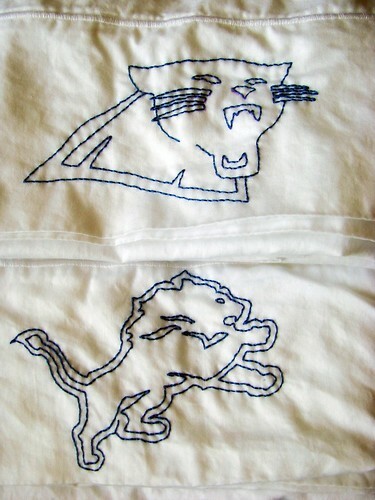 If you want to make pillowcases like this, buy high count percale pillowcases and launder them. 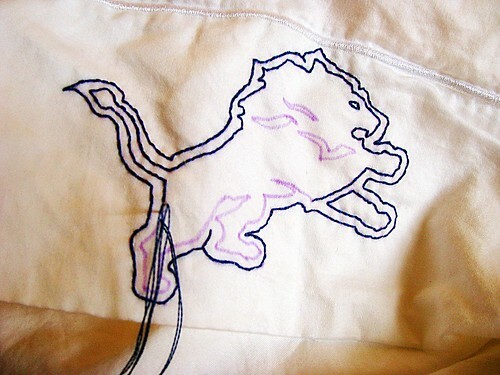 Then either draw or trace your design with a fabric marking pen that’s air or water soluble and stitch along your lines with two strands of embroidery floss to complete the pictures. When I tried to think what would give my in laws sweet dreams, one word came to mind — camping! 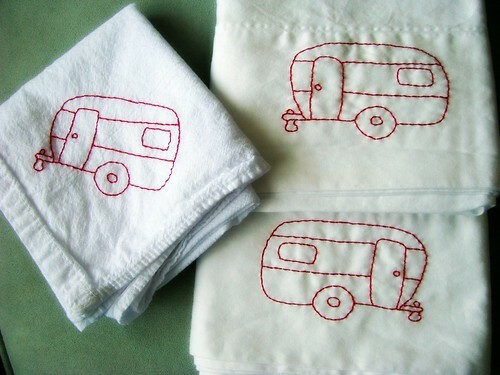 They can use their camper pillowcases at home to dream sweet on-the-road dreams or use them along with the camper dish towel as camper linens. 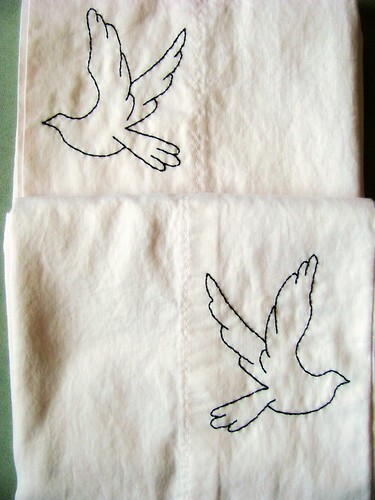 My husband’s brother and his wife got doves. If you put the pillows the “wrong” way, with openings in the middle of the bed, they’ll be lovebirds and fly together for a smooch. 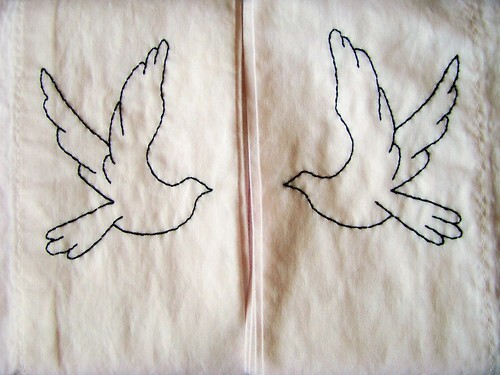 But after I stitched them I realized that put the other way, they’ll fly away from each other. Who knew pillowcases could be such a metaphor for marriage? Make sure to keep flying together! These pillowcases should get softer and softer with each washing, so I hope they bring many years of sweet dreams to their new owners.